"I pay tribute to all freedom-loving countries and peoples and our martyrs, and I would like to tell all Palestinians: Israel considers them as criminals," Abbas told the U.N. gathering in New York. "Why? In Israel there are thousands who are used to assaulting everybody … Why is the man who killed [former Israeli Prime Minister Yitzhak] Rabin a hero while our people are criminals?" "I pay tribute to our hero martyrs and prisoners of war," he continued. "I would like to tell you all that soon the dawn of freedom and independence will shine and occupation will go into the darkness of history." Each year, the Palestinian Authority allocates hundreds of millions of dollars of its budget to pay terrorists and their families for carrying out attacks against Israelis. In 2017, the PA paid terrorists and their families more than $347 million, and this year that figure increased to $403 million. Those who are imprisoned in Israel receive monthly payments, in some cases for life, and the more severe the crime, the higher the reward. For "martyrs," those killed while perpetrating an attack, the PA gives their families a one-time payment, followed by monthly allowances for life. Under PA law, 7 percent of each budget must go to paying terrorists, or to their families, if they are killed in the act, according to Avi Dichter, chairman of the Knesset Foreign Affairs and Defense Committee. Abbas has previously suggested that ensuring payments to terrorists is the PA's top priority. "Even if we have only a penny left, we will give it to the martyrs, the prisoners, and their families," he said in July. The United States has responded to these payments with the Taylor Force Act, which President Donald Trump signed into law earlier this year. The measure cuts all U.S. aid to the PA until the Palestinians stop their payments to terrorists. During his speech on Thursday, Abbas denounced the Trump administration for cutting aid and taking other punitive actions against the Palestinians, such as closing the Palestine Liberation Organization's office in Washington, D.C.
Abbas also castigated Trump's decision last year to recognize Jerusalem as the capital of Israel, saying that East Jerusalem is the Palestinians' capital. "East Jerusalem, which has been occupied [since] 1967, is our capital," Abbas said. "There's no peace otherwise, and there is no peace with a state of temporary borders." Abbas further criticized the Trump administration's approach to the Israeli-Palestinian peace process, saying that the U.S. can no longer be trusted as an honest broker. "Now we view the U.S. with new eyes. The U.S. cannot be a mediator single-handedly. We have the Quartet," he said. "Anyone can join the Quartet to act as mediators between ourselves and the Israelis. But the U.S. alone? No, because they are too much biased to Israel." Abbas was referring to the Middle East Quartet, an entity comprised of the U.S., the U.N., Russia, and the European Union that is involved in mediating the peace process. "I call upon all the countries of the world that have not yet recognized the state of Palestine this long overdue recognition," he later said in his speech. "I can no longer see a convincing reason for the continued delay of the recognition of Palestine by some countries." Abbas devoted a large portion of his speech to attacking Israel's recently approved nation-state law, which defines Israel as the nation-state of the Jewish people. "Last July, Israel adopted a racist law that crossed all the red lines," he said. "This law denies the connection of the Palestinian people to their historic homeland and dismisses their right to self-determination and history and heritage, as well as the U.N. resolutions relevant to the Palestine question and the agreements concluded with Israel." "This law will inevitably lead to the creation of one racist state, an apartheid state, and thus nullifies the two-state solution," he added. Experts have noted that the nation-state law neither infringes on the individual rights of any Israeli citizen nor creates new privileges for any citizen. 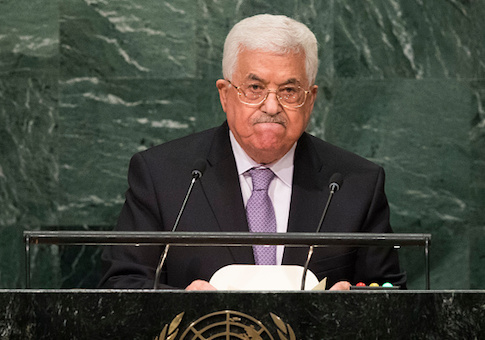 Israeli officials criticized Abbas' speech as counterproductive and potentially dangerous. "Instead of accepting Israel and the U.S.'s outstretched hand, the only thing that interests [Abbas] is to settle scores and drive the region toward confrontation," said Israeli Defense Minister Avigdor Lieberman, according to Israel Hayom. This entry was posted in National Security and tagged Israel, Mahmoud Abbas, Terrorism, United Nations. Bookmark the permalink.